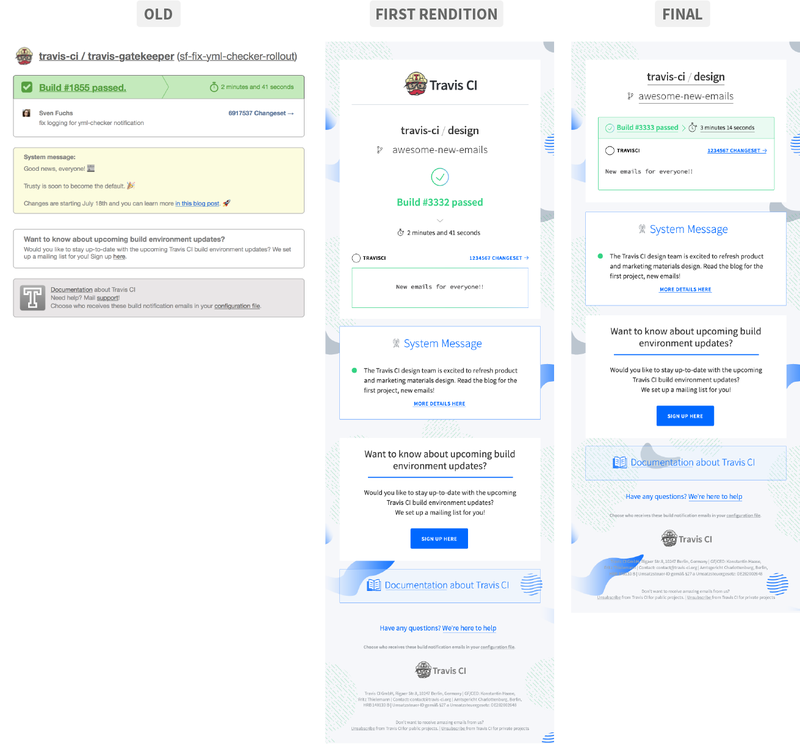 The Travis CI Blog: Redesigned Emails at Travis CI! Redesigned Emails at Travis CI! It’s been a big year for the Creative Team at Travis CI! Our small (but mighty) team has grown over the last year and we’ve been working on many things to improve your experience. One of our most extensive projects has been incorporating new visual styles throughout our product and marketing materials, which you may have spotted in our recently-released, redesigned emails. Since it’s been such a big project for Creative, we thought you might be interested in how we made those changes, incorporated user feedback to improve our work, and finished up the project. From the beginning of the project we knew that that our emails were being viewed by thousands of users around the world — with a mostly untouched 6-year-old design. In fact, we now send over 1.3 million emails a month and about 15% of our app traffic comes from emails — it was very much the time for a change! By highlighting our content in more efficient ways, we wanted to give a breath of fresh air to one of the most important ways users interact with Travis CI. This was also a great place to start incorporating some of the exciting design changes the Creative Team has been working on. Our emails went through quite a transition. From start to finish we had several versions before we finalized the designs you see now. The redesign for our onboarding, trial, and build emails were prioritized first because they are seen by most of our new and current customers. This was a chance for us to make a good first impression with our new users and improve the user and visual experience for our existing users. Most of all, it was important for us to redesign the emails to effectively organize and highlight the information that our users need, especially in our build emails. The emails were super fun to design! They allowed us to be playful and intergrate new colours and textures. Most of all, we loved creating a new and engaging experience for everyone. Thanks so much for all the community feedback! We care about what our community has to say about the work we ship and the experiences users have when interacting with our design work. When we initially released our new emails, we received both positive and critical feedback, especially around our build emails. With that feedback we decided to make further changes to improve the user’s experience. A special thanks to everyone who took the time to write to us with your comments and feedback! Your feedback gave us a chance to reflect and re-evaluate the design decisions we had made. Our work only gets stronger with the help of our community. This is the start of great things to come from the Creative Team at Travis CI and we hope you love these emails as much as we do. Keep an eye out for more changes and please let us know what you think!